BENG MAROI, for a long time the oldest living Chewong and a key-informant to many researchers from all fields, died in the early hours of Friday, 26 April 2001. Most of the Chewong say he was at least a hundred years old; a few would even claim that he was nearer to 200 – an indication no doubt to his revered status in the community. 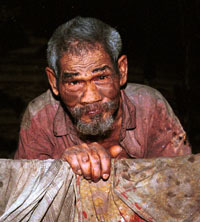 Having begun his ‘informant’ role in the 1930s, and having been around at the time of “big rains and much lightning” – the 1926 Great Floods – it is likely that Beng was around 80 years when he died (no small feat for an Orang Asli in his circumstances). Beng was buried the same day according to Chewong observance in a lone grave not far from the hamlet where he spent the last year of his life, about 40 minutes’ trek from the main settlement at Kampung Sungei Enggang. Sadly, Beng’s passing represents yet another loss this year for the Orang Asli community. And sadly, too, he died in poverty and in uncertain times for his people.